— Writer. Critic. Broadcaster. Stand-up comedian (”charmingly leftfield with a warm, oddball sense of humour”). MC and literary events host. — Viv’s 2018 Edinburgh Fringe show is VIVALICIOUS at Underbelly at 4.10pm from 1 to 26 Aug (13 off). Tickets here. Director: Jess Fostekew. Promoter: Bound & Gagged. For PR queries, contact maura@mauracommunications.com. Previews listed here. — Viv’s new book, out in the UK in paperback June 07 2018, is The Anna Karenina Fix: Life Lessons from Russian Literature (Fig Tree). It has been bought by Abrams in the US (for publication October 2018) and by Individuum Publishing in Russia. Featured in Books of the Year in The Observer, The Spectator, The Sunday Telegraph and The Times. — Transworld has acquired Viv’s next book How to Own the Room: Women and the Art of Brilliant Speaking, due end 2018. — Viv’s new two-part BBC R4 documentary on Russian comedy and Soviet satire (Oct 2017) is still on Listen Again. — Viv hosts We Are Women, shortlisted for Podcast of the Year at the 2017 Audio Production Awards: latest episode (“Traditions”) with Grace Dent, Jen Brister, Amber Butchart and Kate Watson-Smyth. — Columnist and agony aunt Dear Viv at The Pool. Columns here. Fortnightly iTunes podcast here. — Viv’s 2017 show ANCHORWOMAN: WHEN THE NEWS GETS TOO MUCH ran at The Stand, Edinburgh, through August and had its finale at Zedel Piccadilly in September. As featured on: BBC R2’s Steve Wright Show and BBC R4’s Bringing Up Britain. — See Viv talking to Andrew Neil on BBC1’s The Daily Politics about news overload in the age of alternative facts here. — Viv’s second Edinburgh show BE MORE MARGO at The Stand received five star reviews (“her comic timing has a flawless ease… charming, witty, clever and observant” — EdinburghFestivals.org) and was awarded an official 2016 Fringe Sell-Out Show laurel. The show previewed at Latitude, Brighton Festival, Leicester Comedy Festival and Bath Comedy Festival. As featured on BBC Radio 2 and BBC Radio 4’s Loose Ends and BBC1 Breakfast. — Viv is a regular guest on Front Row, Saturday Review, Saturday Live and Woman’s Hour and has also appeared on Today, The World Tonight and Quote Unquote. — Viv’s TV reviews in the Guardian. Latest blogs: Strictly Come Dancing: Judgewatch, Poldark, War and Peace, Indian Summers. Favourites: Gogglebox, Strictly, The Apprentice, Bake-Off, Masterchef, Poldark, The Night Manager, House of Cards, The Unbreakable Kimmy Schmidt, Bloodline. — Author of “stand-up meets mid-life crisis memoir” I Laughed, I Cried: One Woman, 100 Days, The Mother of All Challenges (Phoenix). No. 1 in Hot New Releases (Comedy) on Amazon.co.uk. Comedy Books of the Year, The Independent. “Hilarious” — GQ. “Heroic” — The Times. “Triumphant” — Marie Claire. More reviews here. — 2015 debut solo stand-up show SAY SORRY TO THE LADY for Edinburgh Fringe (Stand 4) previewed in Bath, Brighton, Bristol, Tunbridge Wells, Stirlingshire, Hastings, Cardiff, Nottingham, London. Five star review here. — Artistic Director, Independent Bath Literature Festival (2013-2016): the 2016 festival featured Gloria Steinem, Sebastian Faulks, Joan Bakewell, Dom Joly, Ben Miller, Al Murray, Austentatious, Shakespeare Gala (with Salon Collective and Extempore Theatre), Vince Cable, Tracey Chevalier and over 200 others. — Shortlisted Glamour Woman of the Year: Columnist of the Year 2014, 2015, 2016. — Judge: Bookseller Book of the Year (Fiction); Desmond Elliott Prize for Debut Novelists (2015); Pushkin House Prize for Non-Fiction about Russia (2014). — Host, Time to Talk at Rose Theatre, Kingston. Interviewees include Jennifer Saunders, Alastair Campbell, Brian Blessed, Brian Cox, Clare Balding, Alastair Campbell, Lynda LaPlante, Jacqueline Wilson. — Resident MC, Dead Parrot Society, The Anglers, Teddington. Book tickets here: http://thedeadparrotsociety.co.uk. — Trustee, Pushkin House,the independent centre for Russian culture in the heart of London. More here. — Made-Up Stand-Up 2013 Finalist. Spontaneity Shop’s Maestro Improv 2012 Winner. Funny Women 2012 Finalist. So You Think You’re Funny 2012 Semi-Finalist. Sequinned jumpsuit enthusiast. Laissez-faire parent. Paper reviewer on Sky News. Panellist on BBC Radio 4’s Any Questions. Literary Death Match judge. Member of The Actors’ Centre. Downton Abbey fanatic. Author of “pap” (Times reader), “air-headed guff” (Telegraph reader) and ”Worst. Article. Ever” (Guardian reader). Loves to tweet. Hates avocados. Hair by Elnett. Name means ‘Lively Fathead’. “Viv is the perfect host for Time to Talk – warm, funny, insightful – she puts everyone at ease but is not afraid to ask the tough questions.” — Liz Beatty, Rose Theatre Kingston. 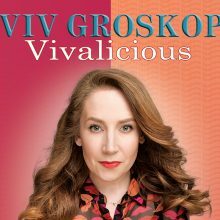 “Viv Groskop is a wonderfully warm and witty woman. Her gig was wildly funny and included much repartee with the audience, creating the perfect atmosphere to open Chagword Literary Festival.” Jo Diffey, Chagword. From left to right: My Favourite Things for A Little Bird; Seven Rules of Writing Comedy for Funny Women; Screaming with Laughter Parent n’ Baby Comedy; Funny Women Finals.